Protect your waterfront investment with the strength to stand up to the elements. Rise above rot, rust and worry lurking beneath the surface by choosing environmentally responsible, cost-effective composite pilings that outlast wood, steel and concrete. Photo: Pilings that Everett and Mark Pearson manufactured and installed in 1997 at Everett’s personal dock still standing strong. How can we help you build stronger, for longer? 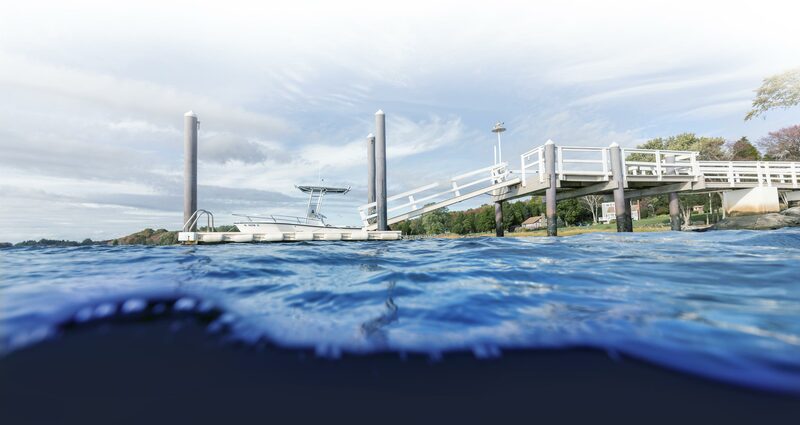 With no chemicals or rust to leach into the water, Pearson Fiberglass Composite Pilings provide an environmentally-safe alternative to other waterfront building materials. Build it once to last for generations. Pearson Fiberglass Composite Pilings save you money in the long run by standing up to storms and protecting your waterfront investment. Learn from the Pearson pros. Get expert tips on installation, access engineering specs, and see Pearson composite fiberglass pilings in action. What makes Pearson Pilings so strong, flexible and light? Learn about the unique properties of composites and how to work with this super substance. The weather is unpredictable but the durability of your materials can mean the difference between deluge and disaster. Find out how Pearson Pilings stand up to storms.